glass earrings, this is a cross section. converted into screw ons with Sterling Silver fittings by request online. Clip ons can be specially ordered on request. All earrings have Sterling Silver fittings and come in Black or Silver card gift boxes. 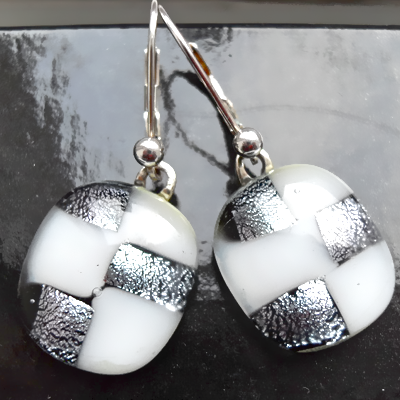 These unusual earrings are made of small squares of White and Silver Dichroic glass on a White base. They have a matching pendant. 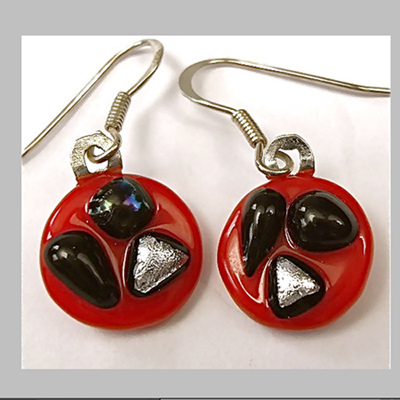 These striking and unusual circular earrings are made of Red opaque glass with Black and Silver accents. They have a matching pendant. 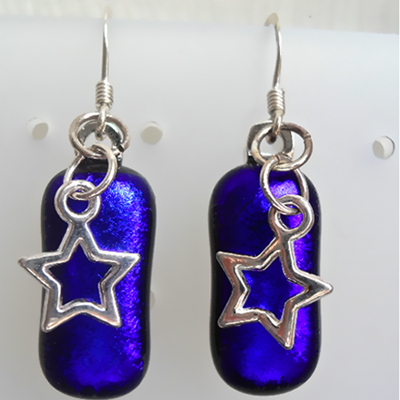 Very bright beautiful Cobalt Blue Duchroic glass earrings with a silver star. 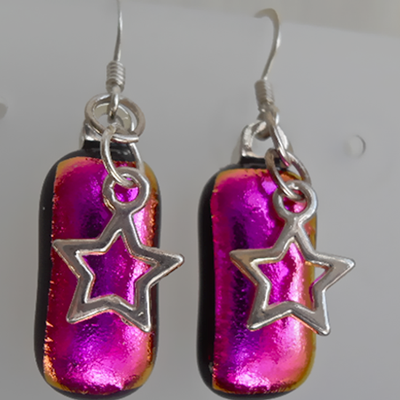 Very striking shiny Magenta earrings with a silver star. 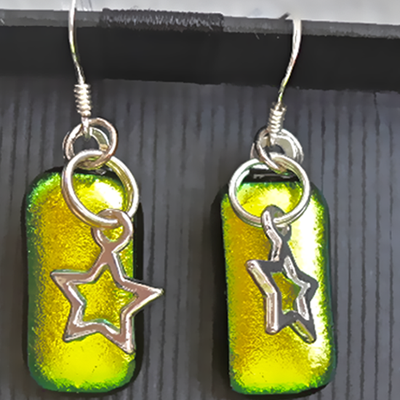 Very bright Gold/Mustard Dichroic glass earrings with a silver star. 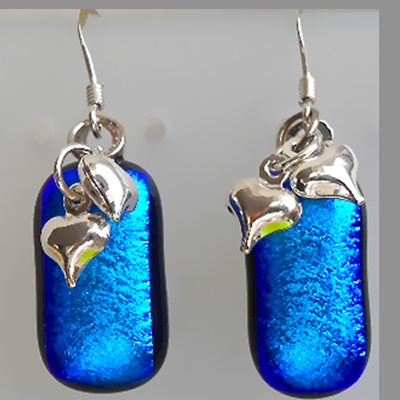 These lovely earrings are made of bright Electric Blue Dichroic glass with two cute tiny hearts attached. 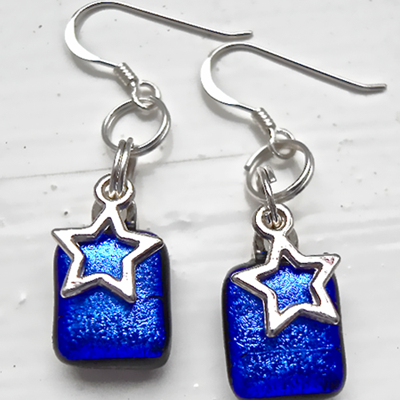 Very strong bright Blue earrings with a pretty little silver star attached. 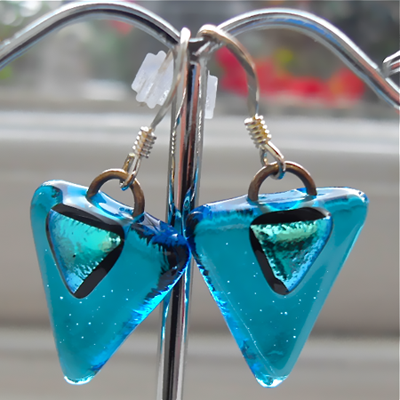 Bright clear Turquoise glass earrings with accents of Turquoise Dichroic glass. 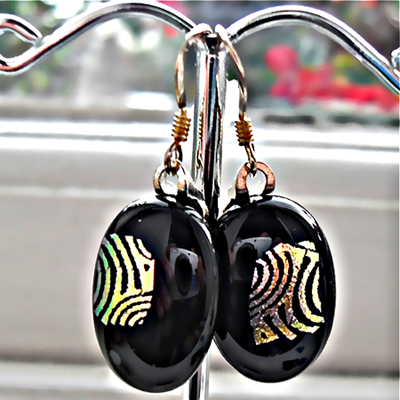 Bold Black oval earrings with accents of Gold patterned Dichroic glass. 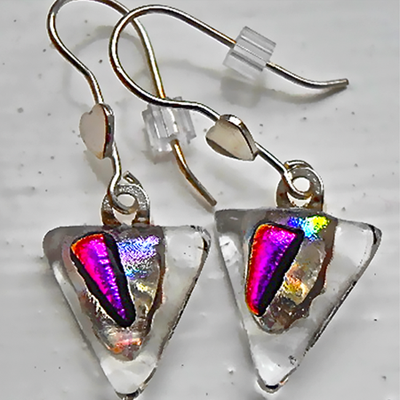 Triangular shaped earrings made of Clear glass with accents of Magenta and Rainbow coloured Dichroic glass. 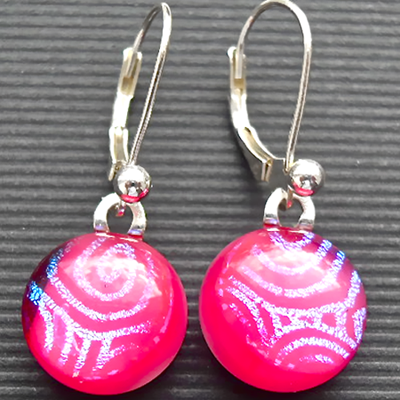 Very pretty Dusky Pink Dichroic glass earrings with an iridescent Blue pattern. They have the heavier more expensive continental style earwires. They match a bracelet in the Bracelets section. Dramatic looking earrings. 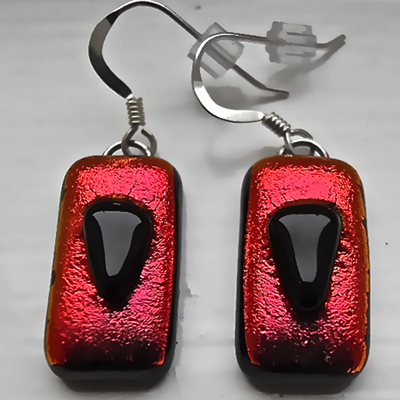 Copper Red Dichroic glass with Black glass accents. 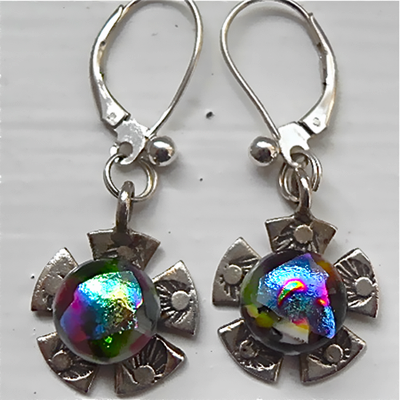 These flower shaped antique Sterling Silver earrings have round pieces of rainbow coloured Dichroic glass. 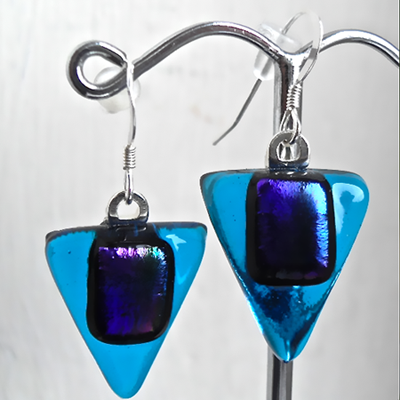 Triangular shaped earrings, made of Turquoise glass with accents of Purple and Green Dichroic glass. 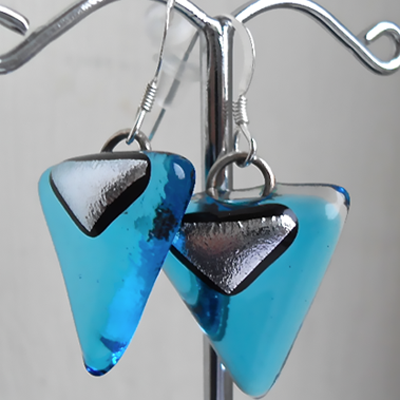 Triangular Turquoise glass earrings with Silver Dichroic glass accents. They have a matching pendant. 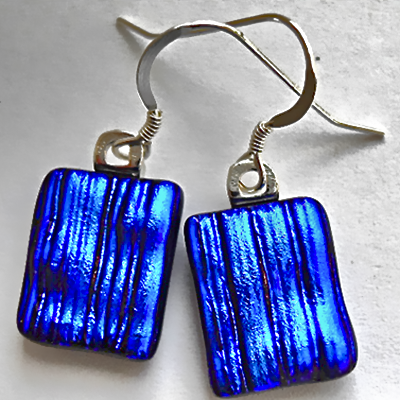 Vibrant Cobalt Blue textured Dichroic glass earrings. There are matching pendants. 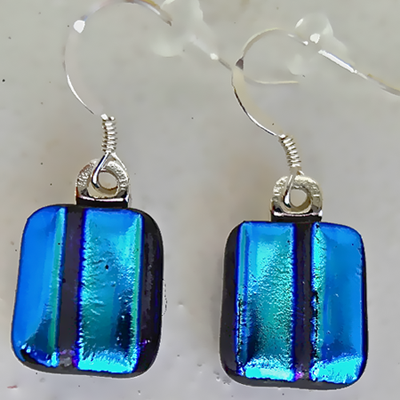 Very bright Teal/Blue textured Dichroic glass earrings, with a dark Purple stripe. 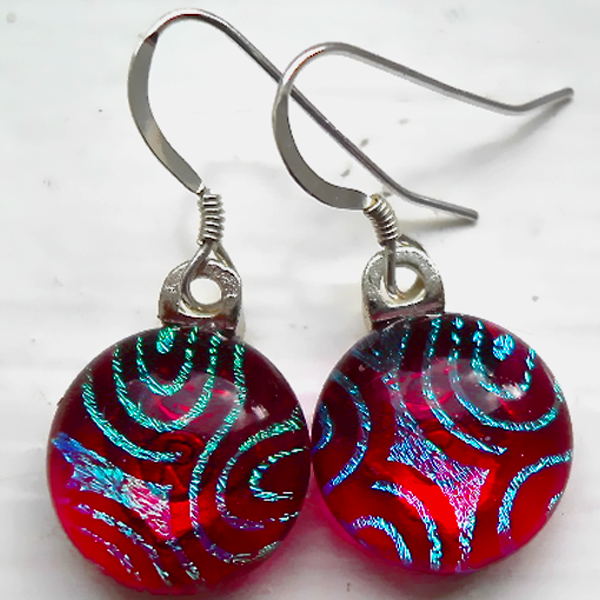 Dark Pink with sparkly Turquoise Dichroic glass design. 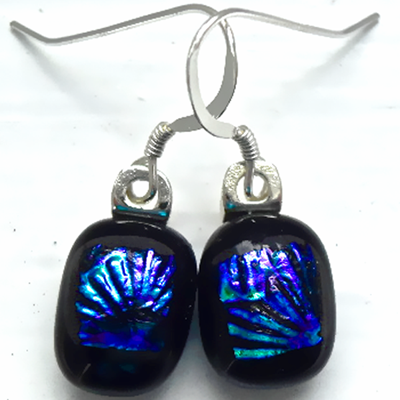 Small dangle earrings, Black with Purple/Teal Dichroic glass. 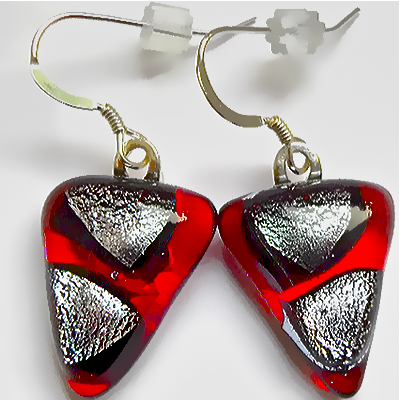 Bright Red with Silver Dichroic glass earrings.